KidznFun.com :: Cooperstown, NY - Baseball, Yes. But So Much More. Cooperstown, NY - Baseball, Yes. But So Much More. Time for a word association test. I say "Cooperstown, New York." You say? Well, who can blame you? 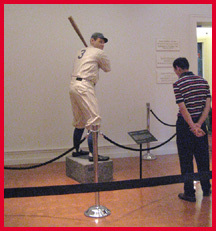 After all, Cooperstown is home to the National Baseball Hall of Fame & Museum. It’s allegedly the place where baseball was invented. It eats, sleeps and bleeds baseball. Yet, there’s much more to Cooperstown than baseball. And, yes, even though it’s primarily baseball that has brought me back here multiple times, it’s the "other" Cooperstown that continually surprises and delights me. People in team shirts, that’s the first thing you notice. People who visit the National Baseball Hall of Fame & Museum, it seems, feel the need to display their loyalty. Yankees. Cardinals. Red Sox. Brooklyn Dodgers. No matter. They wear t-shirts, game jerseys, baseball caps, even team socks. But, you know what? It doesn’t matter who your team is. To we baseball fans, even casual ones, the Hall is about more than the game. It’s about Americana. It’s about our youth—even if you’re still a youth. It’s about Little League games, stickball games, high school teams, and those memorable major league moments you saw live at the ball park—or on TV. The Hall is forever young. No matter how many times you visit, there’s always something fresh about being here, especially the rejuvenation that comes from conjuring up those beloved memories. Of from creating them—during one of our more memorable family outings my dad, my brother and my then nine year-old, Dan, created our own historic baseball moment by staging a major wiffle ball game on the Hall’s back lawn. The nostalgic magic starts with the pair of wax-museum statues in the main lobby. Ted Williams and Babe Ruth. It doesn’t stop til well after you’ve left town. Where to begin? I like the short introductory film at the Grandstand Theater, a beautifully made depiction of baseball’s role in American life. I’m also partial to the old stadia exhibit (well, I did spend much of my youth watching the Giants and, later, the Mets at the long-ago demolished Polo Grounds in Manhattan); the World Series Room takes you back to mystical moments—even if those were only one year ago; and the exhibits on African-Americans in baseball and women in baseball illustrate the game’s social/historical reach. But, I suggest to a first-time visitor—just let your interests take you where they will. Like the re-created locker room with a locker for each team. Everyone automatically migrates to their favorite. On my most recent visit, somewhere between major exhibits, I stumbled across a small crowd gathered around a TV set. Kids sat on a park bench or on the floor. Adults stood in a semi-circle. A series of in-game blooper videos had caught their attention. 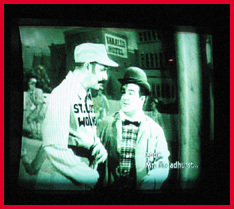 But then Abbott & Costello appeared doing the classic "Who's On First?". What would these kids think? They were clearly too young to know Abbott & Costello, to know about Vaudeville, and probably to have seen "Who’s on First?". They were enthralled. They laughed and quoted from the script as they left. If baseball holds universal appeal, this—maybe the best baseball comedy skit ever—certainly illustrates it. And, of course, there’s the Hall of Fame itself, where grandpa just might want to spend an entire afternoon reading plaques. Myself, I have never left the building without paying homage to my two main men—Willie Mays and Gaylord Perry. Mays because he was the heart of my beloved Giants; Perry because he survived in the big leagues not through innate talent, but by guile, guts brains and, yes, even by cheating. I was at Shea Stadium the night Perry managed to save his job by pitching ten scoreless extra innings . . . But, that’s a whole ‘nother story. 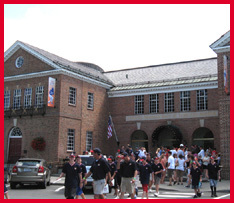 When you’re done, walk three blocks over to Doubleday Field, where the Induction Ceremony Game is played annually. It’s what a baseball park should be. And, if all this baseball has inspired you, stop in next door to the ball park and hit some batting practice at the Doubleday Batting Range. Hall of Fame admission is good all day. That’s good, because it’s not unusual for folks to find themselves wandering back to the Hall after lunch and, then again, after dinner. 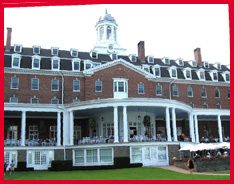 The Otesaga Hotel looks like something from another era. Nearly 100 years old, here’s a building and grounds that hearken back to a time when grandeur defined a blue-blooded resort hotel. Huge columns dominate the front facade of the impressive brick building at the top of a curving driveway. Behind, a broad wooden porch lined with rocking chairs looks over an expansive lawn and a croquet court out to the Leatherstocking Golf Course’s 18th green and to Ostego Lake beyond. One expects suave Fred Astaire or Cary Grant to arrive at any moment. But, don’t be fooled. Yes, gentlemen must wear jackets at dinner in the main dining room, but this is not a snooty place. Indeed, as I sat peacefully rocking on the porch of a Sunday afternoon awaiting colleagues’ arrival, kids were running all over the lawn, playing croquet and splashing about in the outdoor pool. Genteel? A bit. Family-friendly? Most certainly. Indeed, the hotel employs a "Director of Fun," and offers The Pathfinders Club for ages 6-13. A quick stop at the concierge desk reveals a daily children’s activity schedule that’ll run ‘em ragged. On any given day, the kids might find themselves swimming, fishing, cookie decorating, playing tag, adventuring on an insect safari, tie-dying t-shirts, hiking, mountain biking or off on a field trip to one of the local museums. Sometimes "Hay You" the clown shows up and keeps ‘em in stitches for an hour or two. And, then, there’s the watermelon eating contest—hands-free, please—that certainly makes a happy mess. Come evening during holiday and other times, family movies are shown. "There’s always something happening for the kids," says Colleen Donnelly, the hotel’s group sales manager. "And, of course, there’s so much for families to do around town." What was it like to live on a farm in upstate New York in the mid-19th century? Finding that out is what the Farmers’ Museum is all about. Set within walking distance of downtown Cooperstown, the Farmers’ Museum displays living history, special exhibits, a country fair and one beauty of carousel ride. The carousel, "a museum you can ride on," shows off hand-carved riding figures that represent New York State’s agricultural and natural heritage. It re-creates a typical carousel circa 1910. Me, I personally can’t ride a carousel: instant motion sickness. But, that didn’t seem to bother any of the kids who were flocking to it. I could, however, indulge with the kids in some of the vintage games being played inside and outside the country fair tent. Who wouldn’t want to try their hand at top skittles (a kind of bowling; sort of), toy boat races, Nine Men’s Morris (n ancient board game), stilt walking or quoits (a kind of horseshoes; sort of)? 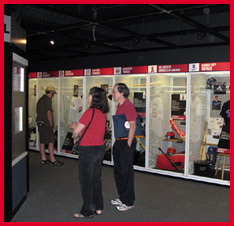 But, before you get to those activities, you must pass through the museum’s changing exhibit building. No problem. The current exhibit is all about ice cream. 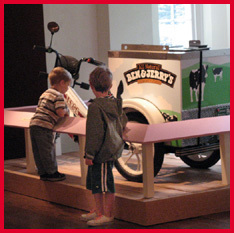 It’s a trip down memory lane for the adults, an eye-opener for kids—"Look ma, there’s Ben and Jerry’s original freezer! "—and it reveals some amazing machines for everyone, like the unlikely milk shake maker that looks more like a well pump than anything else. 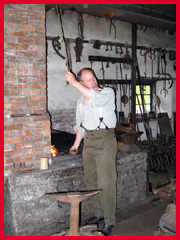 "How," I asked the blacksmith, "do you make the twists in those decorative pieces?" "Let me show you," he replied with pleased eagerness. "What you do is..." heat up a piece of iron till its red hot, pull it out of the fire with special tongs, put it in a special vice that turns, and slowly rotate the vice while holding sure to the iron piece. In an age where few of us—kids or adults alike—know where things come from or how they’re made, having people demonstrate how things were done one and a half centuries ago is an eye-opener. a printer had to painstakingly lay out typeface—upside down!—to print a small newspaper or poster. You see all this in action at the Farmers’ Museum. And, then you get to meet the animals of the Lippitt Farm. The small barn that houses the baby animals is probably the biggest hit. (You must come at the right time of year, of course.) But, there are beautiful horses, sheep, goats, pigs and cows to see, as well. Altogether, for city dwellers or suburbanites like me and mine, it’s a cool combination of historic and cultural enlightenment. Head down to the main dock and board a boat at the Glimmerglass Queen Tour Boat Company for a leisurely cruise around the lake. Join Captain Chris Palumbo for a fishing expedition aboard C.P.’s Charters. Rent a canoe or rowboat. Swim from the Otesaga’s dock. See how Belgian-style beer is made at Brewery Ommegang. Scare yourselves silly by roaming the town after dark with Cooperstown Candlelight Ghost Tours. Enjoy a play at the Cooperstown Theatre Festival. Take in historic and fine art at the Fenimore Art Museum; or at the Smithy-Pioneer Gallery set in Cooperstown's oldest building. Go hiking, swimming, fishing, picnicking, etc., at Glimmerglass Sate Park. They’ve been singing arias and choruses at the Glimmerglass Opera since 1975 and, even though I’m no opera aficionado, I felt compelled to stop on my way out of town. Here’s a place where the opera lover and newcomer can feel at home. It’s not overwhelming: no grand opera house with huge chandeliers and people dressed to the nines. I mean, these guys started out performing in the high school auditorium. Now they perform in the Alice Busch Opera Theater, a welcoming, wood-sided, 900-seat theater set on 43 acres of manicured grounds and outfitted with these oddly wonderful sliding walls that allow fresh air and country views before performances and during intermissions. How cool is that? What’s more, the company presents a Family Day during the season. This year’s was held in early July. The performance was Offenbach’s Orpheus in the Underworld, a funny, light-hearted piece that ends with a flourish—a mass Can-Can number. Family Day also features activities like arts and crafts, storytelling and, this year, Can-Can lessons. Kids’ tickets for ages 6-18 cost only $10, and adults receive 15 percent off their own tickets when bringing a child. This is first-class, professional opera, with name performers presenting some 40 performances of imaginative and sometimes challenging works during an eight-week season. People come from around the world to attend performances here, and I’d certainly list the Glimmerglass as a must-do during a Cooperstown visit. For those with the time and inclination, the "things to do" list extends beyond Cooperstown. Such as? The Petrified Creatures Museum of Natural History, Richfield Springs. So, you see. There really is a lot more to Cooperstown than baseball.